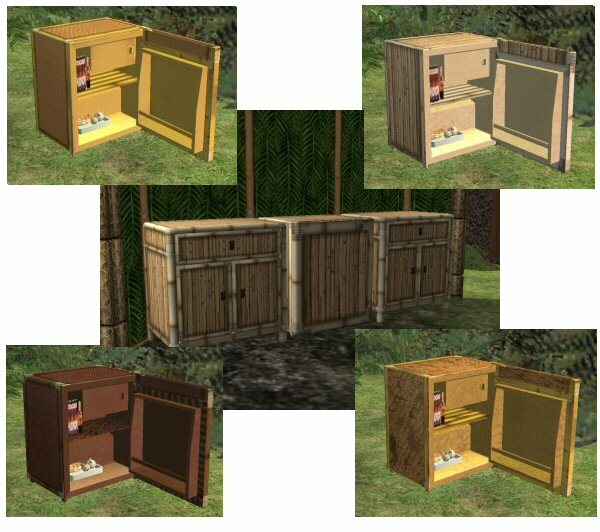 My shipwrecked sims need something to keep their food in. Fullsized fridges just dominate their grass hut, so I was going to use the minifridge - but could only find it in modern, glossy veneer finishes. They have an outdoor cellar, but sometimes you just don't want to go out into the monsoon. I asked around but couldn't find any suitable recolours, and in the end I made some. 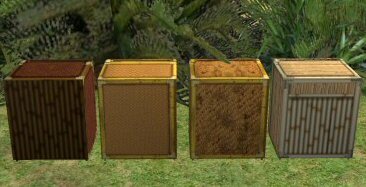 These are recolours of the ""MMM" Mini Fridge", so you need Uni for these to show. The mesh is surprisingly complex. Certain bits are pulled from odd places; the same texture will be used with high definition in one spot but horribly stretched in another, so it wasn't easy. The insides are not strongly patterned for this reason, but I did colour them to blend with the outside. I'm slowly getting better at PaintshopPro. Someone told me recolouring was easy. Phew! Not this batch. It took a lot of trial and error to get these good enough. 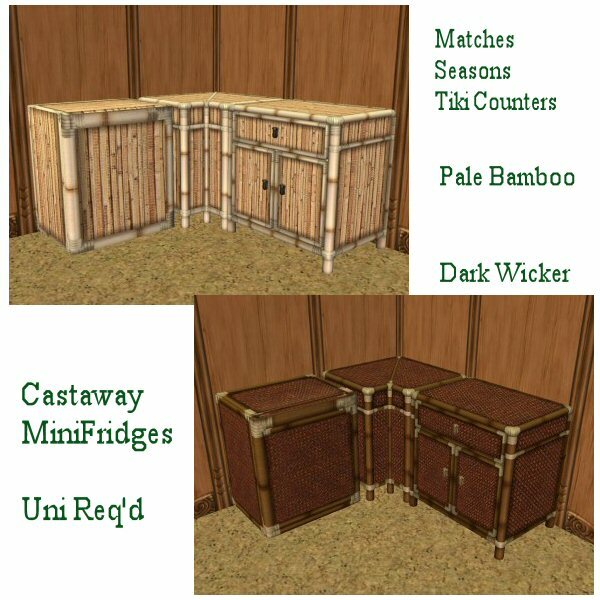 These recolours match the Tiki counters - "CocoCounter from Nothing Atoll", which came with Seasons. You can use them without Seasons, but you won't have the matching counters of course. 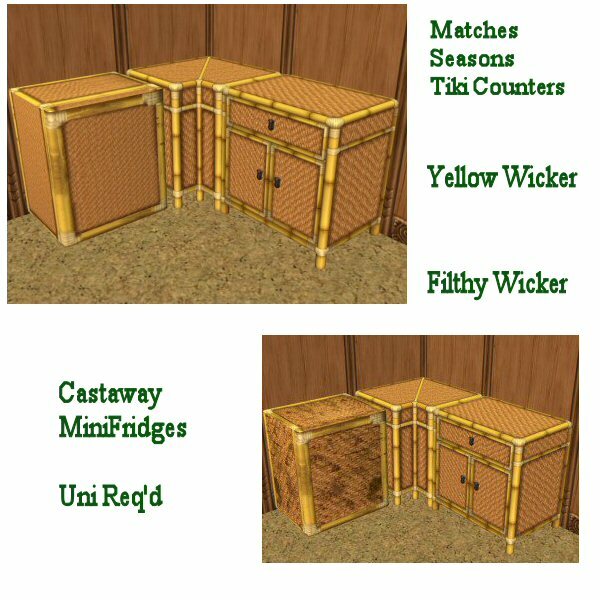 As well as the three basic counter combinations, I made one fridge using the dirty state of the yellow wicker - for those shipwrecked sims who never clean up after themselves. 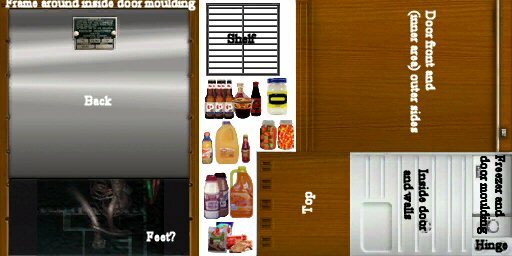 I'm not sure you'd want to eat anything out of that fridge though. In the end, this is the selection I came up with. Not absolutely perfect, but they do match my counters and don't look out-of-place in the hut. Textures are all borrowed from Maxis. I'm including a recolouring map in case someone else wants a go. 550 people have said thanks to aelflaed for this download. -Open Coals Rotisserie Spit- For Cavemen and Campers Alike!